LIVE IN THE HEART OF THE CITY! 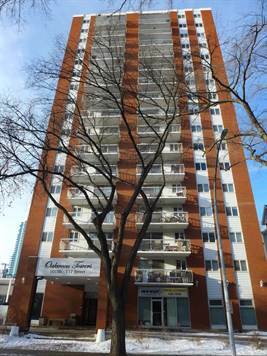 This well maintained 8th floor one bedroom condo has a view of the Downtown. The condo has a large living room ; dining area; galley kitchen; large bedroom; a storage room and a large balcony to enjoy those great summer days. Oakwood Towers is located conveniently to the U of A; NAIT; and MacEwan University. The three utilities power, heat and water/sewer are included in the condo fees. The building has a beautiful, comfortable lobby; a swimming pool and an exercise room. The laundry is on the same floor. This condo must be viewed to be appreciated.